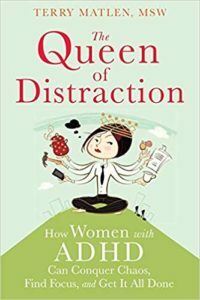 Looking for books about ADHD, both nonfiction and fiction books? Read on for 15 of the best. Why are books about ADHD so important? I was diagnosed with ADHD in high school, along with another learning disorder, after a few very long years filled with missed homework assignments, teacher eye rolls, mystified parents, and a great deal of yelling and tears. My first reaction was a huge sigh of relief. I was not crazy, lazy or stupid, after all! It felt good to have a name I could put to this thing that had suddenly slammed down on top of me like a wall after years of academic success and blending into the background as the quiet kid in class. But the relief was quickly followed by a slew of questions. I needed to understand what this new label meant, and what I could do work with my weaknesses and strengths better. I have never been much of a talker, so for this, I turned to books. Luckily, there are a lot of options out there to choose from. Here are some books about ADHD to help you get started. NOTE: It’s no secret that ADHD diagnosis still has a long way to go for minority populations. All the same, I was extremely disappointed to find a lack of books written by or about authors of color on this topic. To learn more about this glaring gap in diagnosis for minorities with ADHD, a great place to start is “ADHD In Minority Youth: Are Misdiagnoses the New Norm?” from BlackDoctor.org. If you have book recommendations or further reading on this topic, please share them in the comments. Upon and since my diagnosis, nonfiction books about ADHD like these have empowered me to make informed choices about treatment, my strengths and weaknesses, and how to talk to others about the ways my brain is different. Being different can cause challenges, but it can also be a gift. This is the core message behind this book from Gail Saltz, M.D., and through its chapters, this thesis is backed up with breakthrough scientific research and case studies of real-world geniuses, as well as methods to help readers tap into their unique strengths and cope with differences. 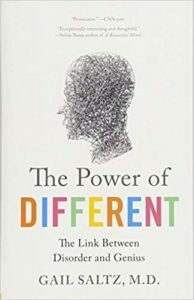 While ADHD is one “disability” explored in this book, its pages go deep into the realms of neurodiversity and includes many others, too. Being an adult with ADHD is rote with challenges. Hell, a lot of people still don’t understand what adult ADHD really means for those who have it—and that can often include adults who have ADHD themselves. This book from professional ADHD coach Nancy Ratey offers an exploration of challenges and coping mechanisms to keep living your life and address your weaknesses. A bestselling resource for ADHD from Edward M. Hallowell and John J. Ratey, recently updated with the most current research. This book offers a series of case studies from real adults and children coping with ADHD symptoms to break past stereotypes, offer coping mechanisms, and understand options for treatments. This book can be a helpful guide for diagnosed adults, their partners, and parents trying to help an ADHD child. Parenting a child with ADHD can be a totally different experience, and the challenges of that child can become the challenges of the entire family. This workbook-style resource from pediatrician Mark Bertin can equip parents to face them, and help their child to cope with the symptoms better. It was not so long ago that ADHD was considered a “little boy” disorder—something only males experienced, during childhood. While this has been disproven, we still have a long way to go in diagnosing, understanding and accepting women and girls with ADHD. 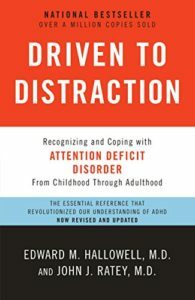 Much like other nonfiction books about ADHD, this title explores the common challenges of ADHD and how to cope with them. But its focus on women with ADHD makes this exploration go in some very different directions, starting with the challenges of diagnosis. Despite much lower diagnosis rates, author Sari Solden affirms through research that women experience ADHD at the same rate as men. But because of the different ways ADHD manifests in women, and the different social expectations put on women, diagnosis and symptoms for women are different, too. This book explores gender-specific issues including the shame of not living up to those expectations, the challenges of developing friendships, and redefining self-image. 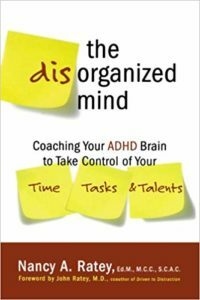 When you have ADHD, the typical day planners and other tools other people use for organization sometimes simply don’t work, or can even add to the clutter. 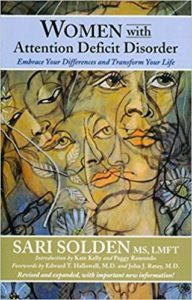 This practically minded book, from Solder (above) and psychotherapist Terry Matlen, tackles the biggest challenges of everyday life with ADHD, with a focus specifically on the lives and unique symptoms of women. Topics include job interviews, meal planning, skin sensitivities, and more. As a former young girl with ADHD, I can testify to how incredibly baffling our mere existence can be to some people. In this book, Kathleen Nadeau, Ellen Littman and Patricia Quinn dive right into the complexity of it all with research, case studies and an accessible approach to breaking it down across all ages and realms of life. It also speaks to the impact of ADHD across the full family and how parents can support their girl with ADHD. 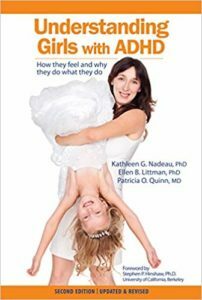 This book focuses specifically on helping parents better understand daughters with ADHD, and help them through the challenges they face. 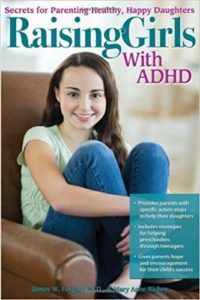 It also offers exercises and steps to help parents and their daughters address the most challenging aspects of ADHD for them both, in a productive and compassionate way. Even better, it’s written by a parenting team of professionals who have raised their own children with ADHD. How-to, self-help, and other nonfiction can be invaluable for adults dealing with ADHD, but there is just no replacing the feeling that you are not alone in these struggles. These memoirs give a first-hand glimpse into the minds and experiences of others with ADHD that lend humor, compassion and solidarity to our everyday challenges. 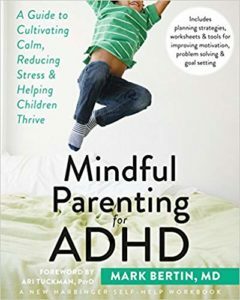 A unique glimpse into the experience of a child with ADHD, this memoir form Timothy Denevi is touted as the first to explore this unusual frontier from such a personal perspective as he wrestles with the understanding that he is a problem for the adults in his life, his struggles to fit in, and feelings that his life is out of his control. 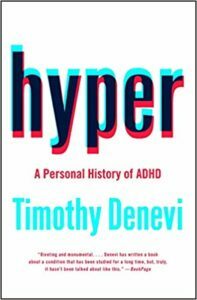 Denevi was among the first generation to be prescribed Ritalin in the 1980s, and this narrative shares his experiences with heart and raw honesty, even as it gives a history of ADHD medication and how it came to be the system we know today. 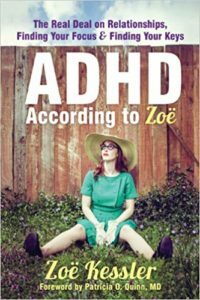 Journalist and blogger Zoë Kessler brings readers along as she discovers her ADHD as an adult and launches into a journey of self-discovery. With the new understanding of her diagnosis, Kessler examines how ADHD symptoms have shaped and interrupted her life, from romantic partners to career and more—and also how she found ways to cope with it. “Relatable, but never predictable,” as tagged on the back cover. Much like living with ADHD, the stories of this narrative from Tom Nardone’s personal experiences growing up with ADHD run the gamut from hilarious to heart-wrenching. This memoir will put reader right into the mind (and thought process) of a person with ADHD. I often feel incredibly lucky that I was not diagnosed with ADHD until my teens. It gave me an important opportunity to start defining and understanding myself without the Learning Disorder box around me. It let me have a “smart kid” label where otherwise I’d likely have gotten a “special” label. The kind of special no one wants to be. Being the ADHD kid comes with a lot of baggage. The way ADHD is talked about with a child can have a huge impact on their perception of their value in the world. The right books can help. 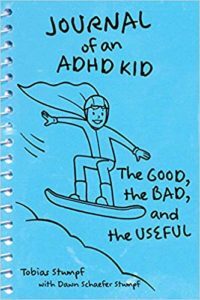 I was surprised to find there was a huge number of ADHD books for children out there—but hardly any that featured ADHD protagonists. Or any character with ADHD defined by anything beyond the ADHD. In fact, I found one. Percy Jackson. Percy Jackson has ADHD, he has dyslexia (did you know it’s incredibly common for individuals with ADHD to also have additional learning disorders?) and most importantly, he is a demigod. 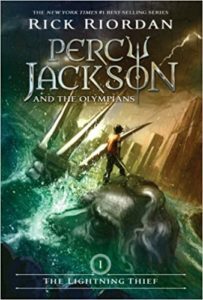 I won’t rehash the plot to this well-known, bestselling series again, but it’s worth reading the heart-warming story of how Rick Riordan came to create this series to give his own son a hero who was like him. 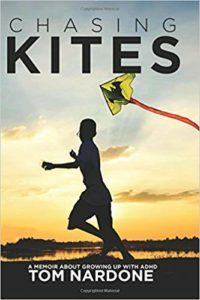 This National Book Award finalist offers kids with ADHD a relatable character who shares their medication routines, mood swings and other symptoms. Through a series of mishaps related to the challenges of ADHD and their consequences (like the impulse to see what happens when you put your finger in the pencil sharpener, ouch) this book may help kids with ADHD feel less alone. Kids can benefit from a stronger understanding of what it means to have ADHD just as much as adults, but getting a child to read an extensive tome on the topic is just unrealistic. This one breaks it down just for kids, with the help of narrator Toby. Throughout the book, Toby shares his own experiences dealing with his ADHD, designed to help readers recognize themselves in his stories. Strewn into the mix are questions, fast facts, and tips to help kids navigate their diagnosis. This book was a ForeWord Review INDIEFAB Book of the Year Finalist. This celebration of neurodiversity is the “The Power of Different” for kids. 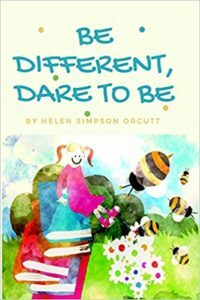 Through it pages, kids will learn that being different does not have to mean being less—in fact, it can be something to celebrate. Different brains are beautiful brains.